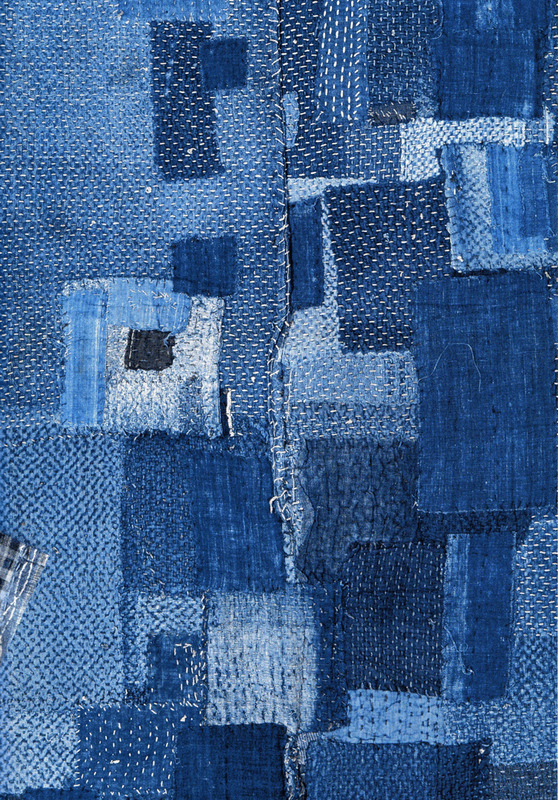 Japanese folk textiles from nineteenth/twentieth centuries, such as comforters, fisherman’s coats, lumberjack’s vests, and other everyday wears, were made of plant fiber mixed with used cotton rags and dyed in indigo, and extensively patched and darned to utilize limited available resources of the regions. The term "boro," meaning castaway rag, may define a new aesthetic and meaning to an alternative creative process, e.g. darning = healing, meditative action = marking time, reuse/repair = recording history. Boro’s imperfect beauty possesses a power that resonates with people and points to an alternative value of "beauty" slowly coming to surface in our social consciousness. Participants in this class will learn about traditional Japanese common textiles made with boro (rags and fabric scraps) and will reinterpret this folk tradition by creating a fabric collage using layering, piecing, sewing, and darning. Participants will also explore the use of water soluble sheets to create open, lace-like structures in collage. Scrap fabrics will be provided by dosa inc. of Los Angeles (www.dosainc.com) and participants are also welcome to bring their own recycled, used, stained scraps or moth eaten woolens to incorporate into their project. In my forthcoming book, I am using a Japanese term "boro" to define a new aesthetic and to bring new meaning to an alternative creative process, e.g. darning = healing, meditative action = marking time, reuse/repair = recording history. "Boro" represents the transformation of inconsequential material to something precious and valuable. Ordinarily, these tattered, castaway rags and the articles pieced together from them would be considered of little to no value. Boro, on the other hand, are viewed as beautiful in a way that defies convention. This type of imperfect beauty possesses a power that resonates with people almost like an emotional barometer. It points to an alternative value of "beauty" slowly coming to the surface in our social consciousness.